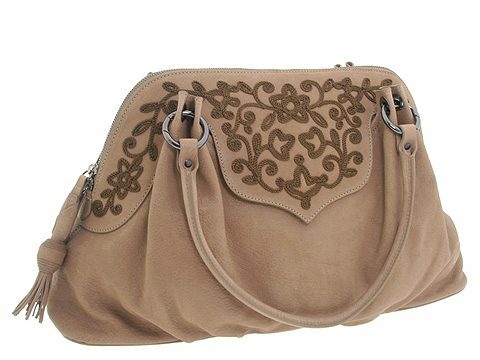 Shoulder bag made of Italian leather with an embroidered design. Holds your wallet, sunglasses, personal technology and a copy of your favorite magazine. Dimensions: 18 wide x 5 deep x 12 high. ; Dual shoulder straps. Shoulder drop: 7 1/2 length. Platform bottom with feet to protect bag when set down. Top zip closure. Interior lining with a back wall zip pocket.